You aren’t the only one with questions about dental implants in South Eastern Ohio. This option in tooth replacement is on the rise, and that leaves people wondering… what are dental implants? And how do implants compare to other options? Your Muskingum Valley oral surgeon, Dr. Jeff Lee, answers the most frequently asked questions about implant dentistry below. A: Dental implants are metal posts, cylinders, or frames, that your oral surgeon positions beneath your gum line. One dental implant takes the place of each missing tooth root. After they have been placed and once the dental implants have healed, your dentist places a tooth replacement on top. Q: How Do Dental Implants Work? A: Dental implants are successful due to something called osseointegration. They are made of titanium, a material that gradually becomes one with the jawbone. After a period of six to eight months, the process is complete, and the dental implant is as stable as any other bone in your body. Unlike with non-implant retained tooth replacement, a denture, crown, or bridge that is attached to dental implants won’t slip or slide around in your mouth. Q: How Do Dental Implants Compare to Other Options? A: Implant-retained tooth replacement offers a number of advantages compared to the alternative. For many people, an ordinary denture or bridge is uncomfortable due to slippage, sore spots, or because the device causes gagging. 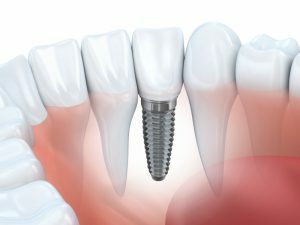 But dental implants stabilize the tooth replacement for a natural-looking, comfortable solution to tooth loss. Additionally, dental implants improve oral health. Our bones need stimulation to remain healthy, and the tooth’s root provides this activity in the jaw. Without a root replacement, the jawbone will slowly degenerate. But dental implants provide a whole-tooth replacement to keep the jawbone healthy and whole. Q: How Do I Care for Dental Implants? A: To ensure the long-term success of your dental implants, make sure you are maintaining excellent dental hygiene. When plaque and bacteria are allowed to build up around the dental implants, a condition known as perio-implantitis can lead to their failure, even long after they have healed. Brush your teeth and oral structures twice a day, floss daily, and visit your dentist as advised to maintain the health of your teeth, gums, and dental implants. A: Dental implants are priced per implant. The amount you will pay depends on how many dental implants are needed. Despite the fact that they are by far the best option in tooth replacement, dental implants are still considered an elective treatment by most dental insurance companies. Some insurance plans are beginning to offer partial coverage, however. But no matter the cost, patients who have chosen to replace their missing teeth with dental implants agree — stability, security, and better oral health are worth the initial investment, and then some. If you are interested in learning about your options in tooth replacement, please don’t hesitate to get in touch with your oral surgeon in 43725. When you type “oral surgeon near me” into Google, Dr. Lee is one of the top returns — find out why! Contact Muskingum Valley Oral Surgery today.